A 3D model that will give a better fitting. A video is created that shows all sides of your teeth and gums, in real time. You can also view the images as your dentist zooms in and out, rotating the image to get the best picture of your oral anatomy. The digital technology shows up instantly on our monitors for your dentist, as well as for your knowledge as well. Feel free to ask questions! How does it work? We simply move the scanner around the area being treated, capturing video of all sides of the teeth and gums. You can watch the 3D model of your teeth appear on the monitor in real time. 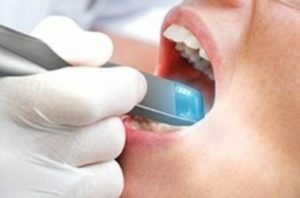 When the scan is complete, we can review, zoom in or out, and rotate the image to get a true picture of your oral anatomy, so you can ask questions and better understand what’s being done. The impression is then sent to a dental laboratory to produce the restoration or aligner. Once the restoration or aligner is complete, we will seat the traditional or implant crown or bridge. With digital dentistry from the 3M™ True Definition Scanner, getting accurate impressions of your teeth is fast and comfortable. Call us to learn more and schedule an appointment today!